Salon Leshey offers the Keratin Complex hair Smoothing Therapy by COPPOLA. This smoothing system “infuses Keratin deep into the hair cuticle, eliminating up to ninety-five percent of frizz and curl”. Keratin hair products are gentle enough to use on all hair types: color treated, chemically processed, bleached or highlighted. 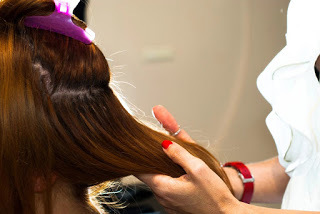 This service is only available by salons specially trained to use this system. We offer Essensity colors by Schwarzkopf, a new more natural alternative to other lines. Essensity uses pure and natural ingredients without compromising the performance of its colors.